Regents Canal – This waterway is by far one of the most extensive canals in the city. Regents Canal winds through some of the trendiest parts of London. The purposely built canal starts out in Maida Vale, also known as “Little Venice,” and cuts through parts of Marylebone, the northern end of Regents Park, Camden Town, and Mile End, before joining the Thames River in Limehouse. There are many great locations from which to access and walk or cycle along the canal. 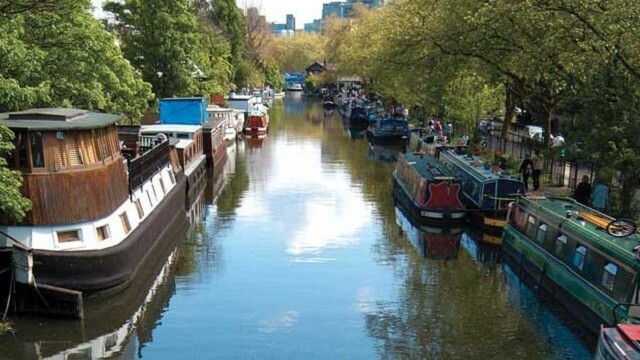 We recommend trying the Little Venice to Camden circular walk. Bow Back Rivers, City Mill River, River Lea – All three rivers are walking distance from the Olympic Stadium and the Arcelormittal orbit sculpture in Stratford. The Stadium sits on an island surrounded by a complex system of rivers and canals that you can access and walk along from many locations, including from the footbridge over Bow Locks which offers a stunning view of the city. Channelsea River, Prescott Channel, Three Mills Lock – Also not too far from the Olympic Stadium is Lee Valley Park an expansive 10,000 acre park that serves as a “green lung” of the city. Several waterways run along the perimeter of the park, however, the park is full of beautiful scenery and it hosts many summer-related activities, such as canoeing and camping. River Brent, Grand Union Canal – The River Brent is a major tributary to the Thames River and there are two major parks near Boston Manor underground station that give access to the River. Both Boston Manor Park and Brent River Park in West London have extensive nature trails that take you along its banks. There is also an amazing system of locks and bridges to walk which can also be accessed on foot where the Grand Union Canal and River Brent join in Ealing. While this is only a shortlist of London’s active waterways, there are many other similarly hidden gems throughout the city and there are even more “lost” rivers and canals which have been long forgotten and even diverted underground. #ExploreLondon and see what you can find.